“ Strategy without tactics is the slowest route to victory. Tactics without strategy is the noise before defeat ” – Sun Tzu. Thanks to the rapid pace of technology and business disruption, CTOs and CIOs are increasingly realizing that legacy applications are a huge risk that could not only derail their business, but could also be a bottleneck and prevent them from achieving success in a digital world. Even though many software-driven businesses acknowledge that application modernization is a top business priority, they are still unsure of the right strategy and way forward. I think this dilemma is partly due to the numerous myths associated with legacy modernization and, partly also due to the limitations of conventional modernization strategies. You must resist the temptation to buy into these quick-fix strategies. It is a myth to believe that any of these approaches will lead to genuine modernization. At best, they will only result in partial modernization, and would neither remove legacy constraints, nor alter the application behavior in any meaningful manner. Layered modernization: Using this approach, each layer of the legacy application i.e. UI, database, and code are modernized separately. While this approach might lower the operational risks, it will only result in partial modernization. Most of the architectural and technology constraints will remain the same, and wouldn’t yield a truly modern, flexible and responsive application. en masse modernization: Strategies such as Rehost, Rebuild, and Rip & Replace call for en masse modernization of the legacy application. These conventional strategies are often expensive, time-consuming, and high-risk endeavors, and each strategy has its own limitations. Rehost will only result in partial infrastructure modernization; Rebuild calls for a complete rewrite, doesn’t leverage legacy investments or accumulated domain expertise, and demands significant investment with uncertain outcomes; Rip & Replace involves discarding the legacy software, and picking a COTS, which rarely meets the business needs and often demands significant customization. A reactive system that is flexible, loosely coupled, scalable, resilient, and responsive. Rehosting makes an application modern Rehosting only achieves partial infrastructure modernization, and doesn’t remove any of the underlying legacy constraints such as technology obsolescence, architectural limitations, and code complexity. UI facelift is the same as application modernization A UI facelift is only a quick fix to web-enable a legacy application and make it look modern, but doesn’t alter its behavior and does nothing to make it scalable or extensible. Adding a wrapper opens up the software Using a wrapper to extract web services or APIs only exposes partial functionality of the application, and the basic behavior of the legacy software is neither modified nor modernized. Automated code migration will solve all legacy problems Code migration typically works better when the migration is within the same technology stack; without architectural modernization, you will only create a monolith in a new technology, with all the complexities of the legacy application. UI facelift: A UI facelift typically entails strategies such as web-enablement or HTML emulation. Web-enablement converts green screens into functional web pages, whereas HTML emulation creates a web or mobile interface to work with legacy application. In both cases, only partial UI modernization will be achieved, without altering the behavior of the legacy application or overcoming the constraints of the underlying architecture or technology. Code migration: This approach is akin to a technology upgrade and relies on using automated tools to either migrate the legacy code to a more recent version within the same stack (ex: from VB to .Net) or migrate to a more modern language (ex: from Forte to Java). While this strategy will result in partially modernizing the code, without architectural modernization, constraints of the legacy code will still continue, and a monolith will be recreated in a new technology with the same complexities of the legacy application. A major limitation of code migration is also the fact that product developers will not understand the new technology, and product owners will not know until the migrated code fails. Database migration: This approach is used to migrate data from legacy systems such as HDBMS (Hierarchical database management systems) or NDBMS (Network database management systems) to a more modern RDBMS (Relational Database Management Systems). This is typically accomplished using automated tools and data mapping. Database migration only helps in migrating data to a more modern and robust database, but doesn’t alter the underlying UI, architecture or technology of the legacy application. Rehost (lift-and-shift): This strategy is based on redeploying legacy applications to a modern hardware and software infrastructure with minimal changes. This approach only achieves partial infrastructure modernization, and doesn’t remove any of the underlying constraints of the legacy application in terms of technology and architecture. This is a myopic solution that only relieves the burden of maintaining the underlying infrastructure, but can never make the application truly SaaS and cloud-native. Rebuild: This approach aims to modernize all tiers of the application along with deployment modernization, and calls for a complete rewrite of the application from scratch, using modern technologies and newer architectural paradigms. While this strategy will yield a fully-modernized application, the fact remains that rebuilding or rewriting an application from scratch is often very expensive, time consuming, and a high-risk endeavor. Success of this approach will be dependent on the availability of people with skills in modern technologies and architectures, and ability to leverage domain or functional expertise of the existing team. This approach also doesn’t safeguard legacy investments, while calling for significant new investments with uncertain outcomes. Rip & Replace: This strategy calls for discarding the legacy application, and picking a commercial, ready-to-use modern application that meets the business needs of the enterprise. The reality is that it is very rare to find an off-the-shelf solution that fits the custom needs of a business, and another major disadvantage of this approach is the fact that significant legacy investments will have to be written off. Apple recently became the world’s first trillion-dollar company by market cap. It wasn’t many years ago that Exxon and Apple sequentially swapped the position of the highest valuation. And just ten years ago the stock market contained only three tech firms amongst the top 10 most valued companies; five were oil giants. Today tech accounts for seven of the top ten with just one oil major (Exxon) still on that list. The World Bank has launched the first bond on a blockchain with the Commonwealth Bank of Australia. According to a statement from the World Bank, this will be one of many experiments that the global financial organization will make into blockchain research. Last June, the World Bank launched a Blockchain Innovation Lab to play around with the technology. British technology companies have attracted three times more venture capital (VC) investment in the two years since the vote to leave the European Union (EU), than any other European country, with London’s thriving fintech and artificial intelligence (AI) sectors leading the charge. First Advantage, a global background check company announced that it will support privacy compliance from its newly opened data center in Amsterdam, Holland. The Atlanta-based company chose Amsterdam for its reputation as one of the most advanced IT markets in Europe. A draft bill approved by the German cabinet recently sets out the government’s plan to set up a special digital infrastructure fund with an initial volume of 2.4 billion euros. The fund will primarily be used to accelerate the digitalisation of schools and the expansion of Germany’s broadband infrastructure. Denmark’s ambition to become a leading Nordic and European location for hyperscale datacentres continues to gain momentum by attracting major industry actors and government support. The country is offering access to a low-cost and expanding renewable energy base to lure global companies such as Facebook, Google and Apple. India has overtaken France to become the world’s sixth biggest economy, latest data from the World Bank show. The South Asian nation is now a $2.597 trillion economy and only a tad higher than France’s $2.582 trillion. It will be the world’s fourth-largest economy by 2022, according to projections by the International Monetary Fund. Global business value derived from artificial intelligence (AI) is projected to total $1.2 trillion in 2018, an increase of 70 percent from 2017, according to Gartner. AI-derived business value is forecast to reach $3.9 trillion in 2022. As the network continues to evolve, organizations are researching technologies and strategies to ensure their systems remain effective. New technologies continue to be introduced at a rapid frequency forcing network professionals to adjust to more complex workflows. 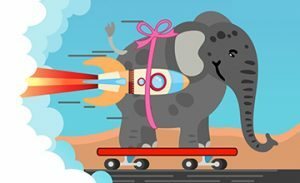 There is no silver bullet for application modernization, and it is important to understand the pros and cons of different modernization approaches, distinguish between myths and reality, and formulate a holistic strategy for creating future-ready applications. Even though having the right organizational culture is equally important in any industry or domain, it is critical in innovation-driven domainssuch as software products and services. Legacy modernization is no longer a choice, but a vital business imperative. To survive and thrive in a fast-changing digital landscape, application modernization should cover the entire product life cycle, use modern software architectures, and focus on end-to-end business capabilities. Keylane consolidated its operations spread across Naarden and Utrecht, into a new headquarters in Varrolaan, Utrecht. In other news, Sampension, Denmark’s third biggest pension company, has entered into an agreement to implement Keylane’s stochastic ALM (Asset Liability Management) Projection Model. Planon strengthened its position in Northern Europe by opening an office in Göteborg, Sweden. The newly opened office will streamline support to Planon’s future and current customers, including Danfoss and Attendo. Chevin announced the launch of a brand-new, consultancy service, that offers clients a comprehensive evaluation of fleet performance and associated management processes. Chevin’s new expert value-added consultancy service will take an analytical, data-focused approach in order to build a strong foundation for making fact-based decisions. We are delighted to share that in the past quarter, there are three additions to our customer landscape, Moveware, Marketing Makers, and Acanthis. 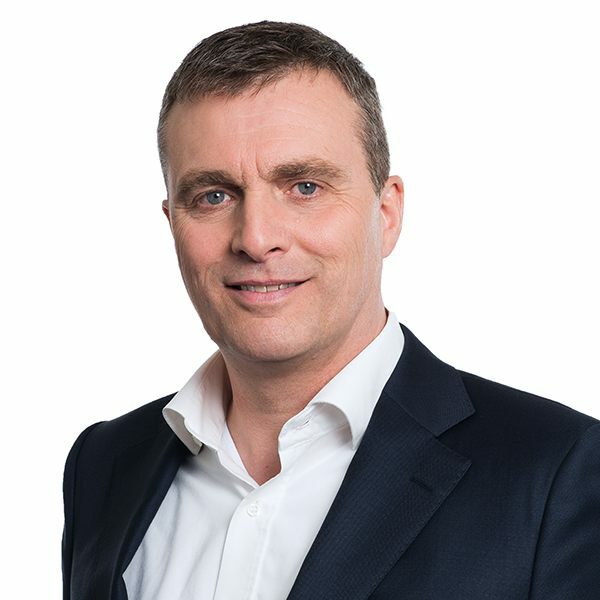 Moveware is a leading provider of software solutions to the moving industry, and is based in Australia; Marketing Makers, is a Netherlands-based, fast-growing business offering a suite of solutions to the marketing industry; Acanthis is a Netherlands-based provider of document management solutions. 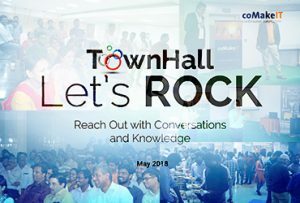 Employee Town Hall: In May, Steven and Kiran, co-founders of coMakeIT held a lively all-hands, town hall session, in which they outlined their vision for the company, and announced the launch of a new portfolio of services linked to Digital Transformation and Application Modernization. In early-July, Thijs Peter our CTO, also interacted with our employees and shared his insights on evolving technology and architectural paradigms. 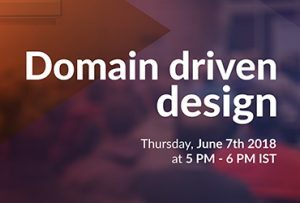 Session on Domain Driven Design: In June, we had the privilege of hosting an offroadssession on Domain Driven Design, delivered by Thedoor van Donge. Theodoor is a well-known innovator and is widely respected as a pioneer in disruptive software technologies. Many technology enthusiasts from the local community, along with coMakeIT’s engineers participated in this highly informative session. 10-yr club: In this past quarter, four more coMakeITians have joined the illustrious 10-yr club. 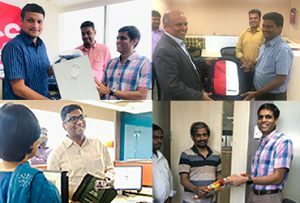 Suresh Kandavilli, Mitra Akondi, Anupam Naik, and Srinivas Chavali have all reached their 10-year milestones with coMakeIT. Needless to say, they not only had a long, but also a rewarding tenure and played a key role in enabling success of numerous customers. 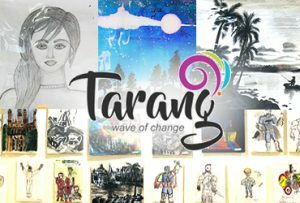 TaRanG: Our employee engagement and cultural club TaRanG, conducted lots of fun events in Karoake, singing, painting, and theme-based photography; These initiatives continue to be enormously popular with widespread and enthusiastic participation. Click here to view the impressive, and highly creative wall-of-art as well as the popular winners, chosen through a poll. 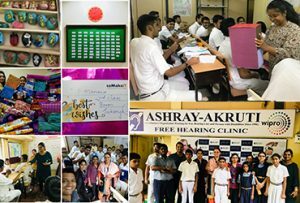 School-Chale-Hum: On the eve of the beginning of a new academic year, and as part of our social impact initiatives, we chose to support the hearing and speech-impaired childrenof Ashray Akruthi school. After collecting a wish list from the school, all our employees pitched in enthusiastically to fulfil the wishes of these needy kids. It was gratifying to see the continuous demonstration of spirit-of-giving from all our colleagues. Social Impact Initiatives: Just as we are committed to success in business and serving our customers well, we are also equally committed to creating meaningful social impact. We continue to support the foundation school and public health initiatives through Support2Connect and Madhunapantula Foundations.